Snap peas, also called sugar snap peas, are grown to be eaten with the pods, not shelling the peas out of the pod. They are harvested when the pods are plump, round and mature and eaten similarly as you would snap beans. The pods are tender and sweet to eat, as are the peas inside the pods. Many people prefer the sugar snap peas over snow peas, which are also eaten with the pod, because the snap pea is so flavorful. As with all peas, they are a cool weather crop and should be grown in the spring. Use a garden hoe to cultivate the soil were the peas will be planted, working some slow-release balanced fertilizer into the soil. Peas do not need much fertilizer, and this should be the only application. Plant your peas 1 to 1-1/2 inches deep and 1 inch a part in a row. Plant two to four weeks before the last frost of spring. 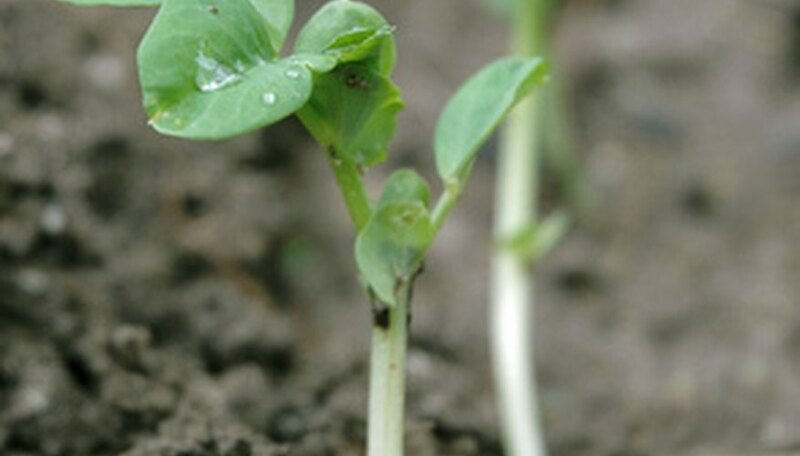 If your soil temperature is 5 degrees F or more, your peas will germinate and grow in seven to nine days. Cooler soils will slow the germination of your pea seeds and it could take as long as a month. Provide support for your peas when you plant the seeds. Unless you selected a dwarf variety, your pea plant can reach 6 feet tall. Erect fencing, trellises, netting or tomato cages to support your growing pea plants. By placing the support system at the time of planting, your pea plants will naturally attach themselves to the supports. Water your pea plants. Keep the soil moist, not saturated. Remove weeds around the plants. Mulch around your snap pea plants to keep weeds down, moisture in the soil and the soil cool, which pea plants need to thrive.